For a long time, I was misguided. I have repented my ways and am attempting to make amends. Yes. I’m talking about radishes. I really used to dislike them – too crunchy, too accrid on my tongue. To own the truth, I still can’t eat a big chunk of radish, especially if it’s very spicy. But when they’re thinly sliced into a salad like this one, these crispy red and white root vegetables are absolute perfection. In France, radishes are eaten as an after-school snack, dipped into coarse salt and soft butter. 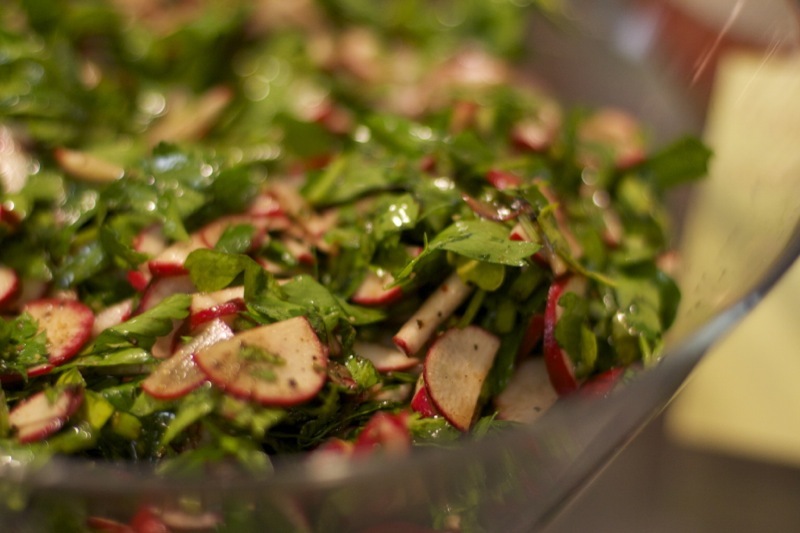 The simple combination of those flavors – radish, butter, salt – inspired this beautifully quick salad. Ameir and I liked this so much that we ate the whole bowl of it, and I went back to the store the next day to buy two more bunches of radish. And yes, we ate all of that, too. This is a technique more than a recipe. I didn’t make exact measurements, but was just tasting and admiring colors to see how much of an ingredient to add. The parsley compliments the crunch and pepperiness of the radish. Altogether, the two make a pretty strong flavor profile. Enter bread, butter, and cheese. The salad is piled on top of buttered and toasted sourdough toasts. I suppose you could make croutons out of them and eat the whole thing from a big bowl. 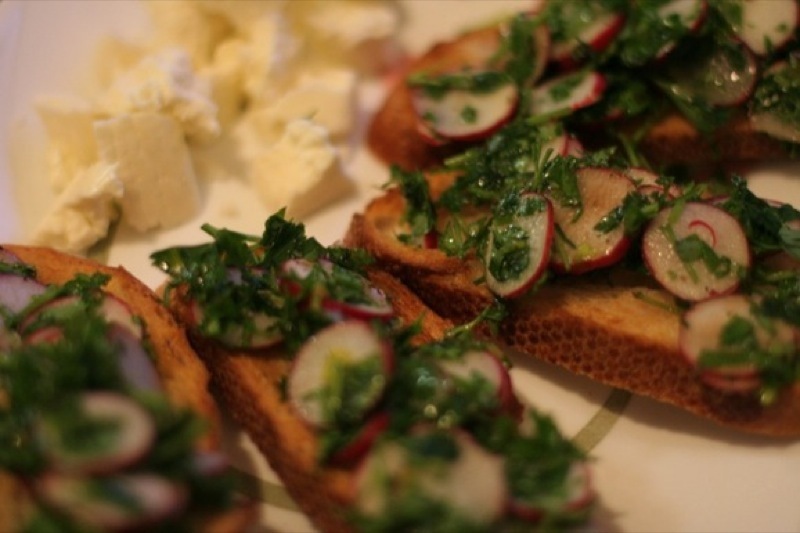 The toasted, buttery bread provides another kind of crunch, but a little warmth and softness to counteract the possible harshness of the radish and parsley. The cheese is the simplest but most important part, I think. I picked a classic syrian cheese, which has the light flavor of ricotta but the texture of a harder buffalo mozarella. I don’t mix the cheese in, but leave it in big crumbles on the side to pop into your mouth in between bites of salad-atop-bread. The salad is dressed very simply – olive oil and balsamic. The former provides a fruity sweetness, the latter a sweet-tart tang. Crumble the cheese into biggish chunks and set aside onto your serving platter. Slice the radishes as thinly as possible and put them into a bowl. Separate the parsley stems and leaves. Give the parsley leaves a rough chop, or julienne them as best you can if you like the leaves smaller. Slice the stems as thinly as possible. These provide a light crunch as well. Add all the parsley to the bowl with the radishes. 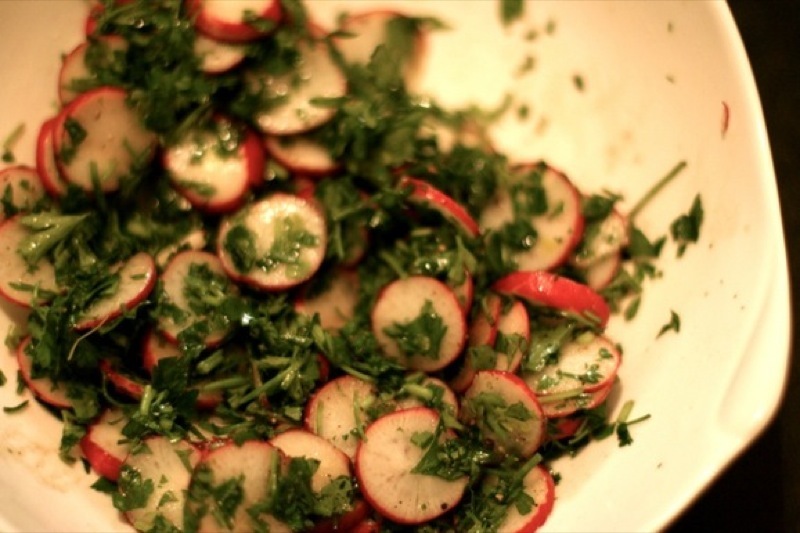 Sprinkle salt and course black pepper onto the radishes and parsley. Pour some olive oil over the salad and mix – start with half a tablespoon, then add another until the salad just glistens and the leaves taste a bit fruity. Pour a little bit of balsamic vinegar over the salad (quite less than the olive oil). The leaves should just taste a bit sweet and tangy. Slice the bread into toasts and spread with butter. Put under the broiler and toast only on one side until golden brown. If you want the toasts very crispy, toast on both sides. Try to time everything so the toasts are still a little warm when you serve. To serve, pile a few tablespoons of salad on top of the toasts. Enjoy creamy bites of cheese as a palette calmer between or alongside bites of the salad. Yay radishes are great! I’m glad you came around. This was a great idea! I tried it a couple of days ago and am like totally addicted to the dish. I just mixed the radishes and parsley with balsamic vinegar and olive oil, salt, pepper, and put it on top of the toast. I topped that with brie and it was to die for. I have left the radish mixture in the fridge for a couple of days and while the radishes arent that crispy anymore, they have more of the tangy taste. This is just a wonderful recipe for a nice appetizer…! Thanks Taiyyaba!